42 infografías para la historia. No sólo un atlas. No sólo mapas. Incluyen increíbles ilustraciones para explicar los fenómenos naturales. 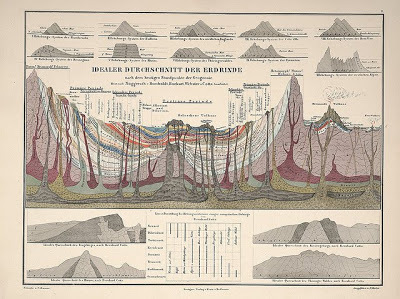 The rise of thematic or special purpose cartography, which focuses on mapping the distribution of single or multiple interrelated phenomena, had its origins in the advances in the natural sciences in the late eighteenth and early nineteenth centuries, particularly with the collection of vast amounts of scientific data and the search for innovative techniques of presenting this data graphically. Examples of early physical geography atlases in the Library of Congress include Alexander von Humboldt’s Atlas gographique et physique du royaume de la Nouvelle-Espagne (Paris, 1811), which records his observations during a 1799 to 1804 expedition to South and Central America; Heinrich Berghaus’s three-volume Physikalischer Atlas (Gotha, 1845 1848), the first atlas to portray the physical geography of the world; Alexander Keith Johnston’s Physical Atlas (Edinburgh, 1848), an English adaptation of the Berghaus atlas; and Traugott Broome’s Atlas zu Alex. 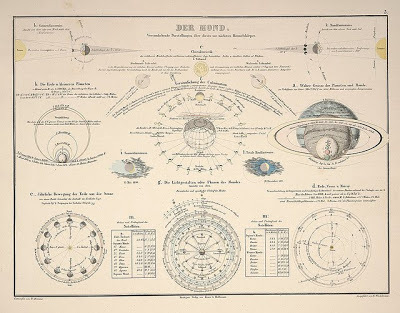 v. Humboldt’s Kosmos [Stuttgart, 1851 1853], which was prepared to accompany Humboldt’s five-volume Kosmos, a complete physical geography of the universe. 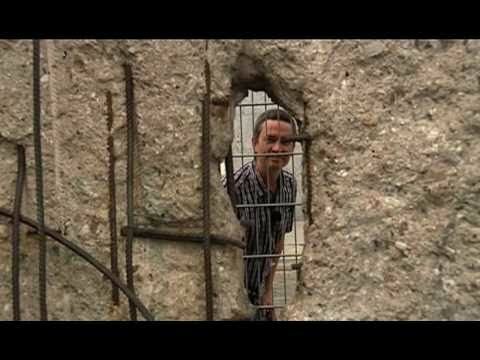 El muro de Berlín en realidad aumentada. Recuperación. La crisis ha terminado. 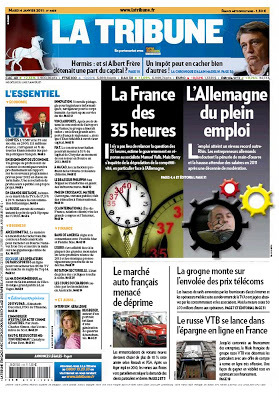 Portada del pasado 4 de enero. Económico francés vs Les Echos. Desde mayo de 2010, Valérie Decamp, 80% acciones. Estonia entra en la zona euro. Adiós corona el 15 de enero. Vídeos sobre la entrada de Estonia. 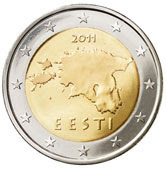 On 1 January 2011, the euro will become legal tender in Estonia, replacing the Estonian kroon at the irrevocably fixed exchange rate of €1 = EEK 15.6466. The kroon will cease to be legal tender from 15 January 2011. Interactivo: las fechas de entrada. 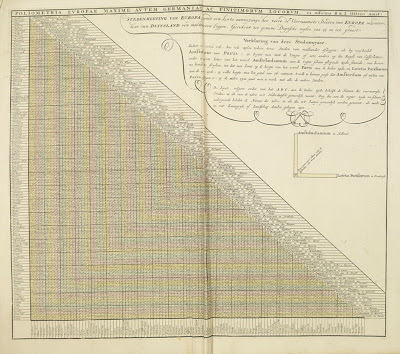 The family business of print and map selling was founded by Joachim Ottens but the active period of map publishing was concentrated in the years between 1720 and 1750 when the brothers, Reiner and Joshua, produced enormous collections of maps, some as large as 15 volumes. These, including copies of practically all maps available at the time, were made up to order and were magnificently coloured. Besides these specially prepared collections they also issued single-volume atlases with varying contents as well as pocket atlases. Publisher: de L’ISLE, G. / OTTENS, R. / I. 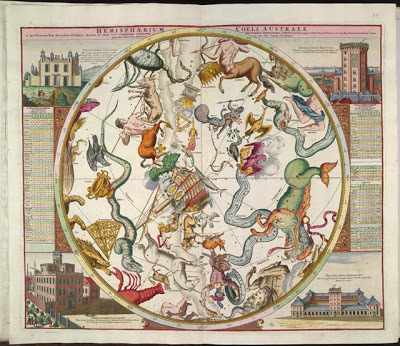 Title: Hemisphere meridional pour voir plus distinctement les terres australes. . . Size: 17.6 x 17.9 inches. With the imprint of the Ottens family – rare. 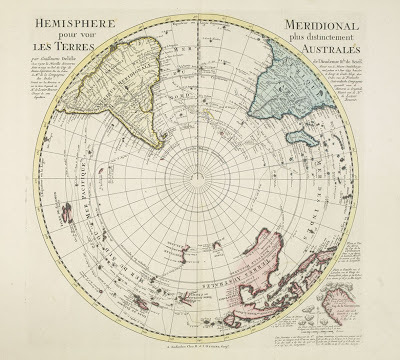 An Antarctic map including a recounting of the discovery of an island south of the Cape of Good Hope which was named Cap de la Circoncision in 1739. A small inset map of the discovered island appears in the lower right. This circular map show the world in an unusual way: using the Poles as the center point of hemispheres that extend to the Equator. 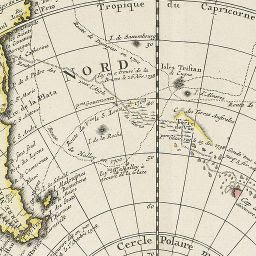 With a text panel in upper left corner : Nouvelles découvertes de 1739 au sud du cap de bonne Esperance par les ordre de M. de la compagnie des Indes. Dressee sur les memoires et sur la carte originale de M. Lozier Bouvet cahrge de cette expédition. Same text in Dutch in upper right corner. Joachim Ottens (1663 – 1719) and his sons Renier and Joshua were prominent Dutch booksellers and map publishers from about 1680 to 1790. Joachim, the founder of the firm, was initially employed as a copperplate engraver by Frederick de Wit. In 1711 Joachim founded his own firm. Though Joachim died only a few years later, his sons Renier and Joshua took over the firm and presided over its most prolific period. OLIOMETRIA EUROPAE MAXIME AUTEM GERMANIAE AC FINITIMORUM LOCURUM EX OFFICINA R. & J. OTTS AMST. 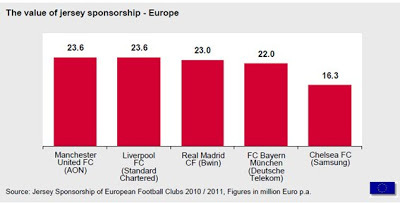 An interesting table listing many European towns and cities plus Bethlehem. Publisher: OTTENS, R. / I. Title: Poliometria Europae Maxime Autem Germaniae ac Finitimorum Locorum. . . 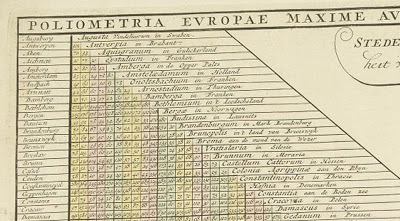 This unusual thematic chart shows the traveling distances from various European cities in a style that is still used in charts today. Reiner & Josua Ottens: Carte Quirepresente Toutes Les Pieces Qui Sont Comprises Dans L’Architecture Militaire, ou L’Arte Des Fortifications . . . Description: Scarce map showing approximately 83 smaller illustrations on all aspects of the military sciences, including methods for the construction of fortresses; artillery; sieges of cities; battles; army units, attacks from seaside etc., but Caspar Specht. The text of the legend in Dutch, text in the illustrations in French. Gorgeous old color example. 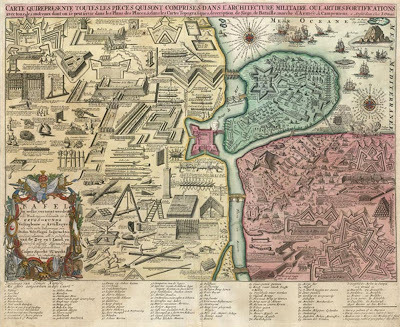 Title: Carte Quirepresente Toutes Les Pieces Qui Sont Comprises Dans L’Architecture Militaire, ou L’Arte Des Fortifications . . .
Reiner & Josua Ottens: [Wall Map of Spain & Portugal] Novissima et Accuratissima Tabula Qua Gallaeciae et Legionis Regna, Asturiarum … Regnorum Arragoniae et Navarra, Principatus Cataloniae . . . 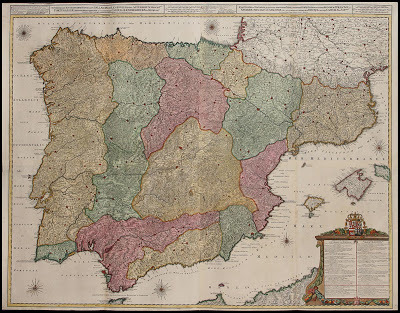 Title: [Wall Map of Spain & Portugal] Novissima et Accuratissima Tabula Qua Gallaeciae et Legionis Regna, Asturiarum … Regnorum Arragoniae et Navarra, Principatus Cataloniae . . .
Gorgeous full color example of Luggert van Anse’s 4 sheet map of Spain, Portugal and the Balaeric Islands, joined flawlessly and presented here as a wall map. Includes a large cartouche with explanations of the political divisions of Spain and Portugal in French and Dutch, headed by coat of arms and 6 compass roses. An uncommon wall map of Spain and Portugal. Luggert van Anse was engraver for Allard, Visscher and van Keulen. This edition was published by Ottens, with additions and corrections. A spectacular example. 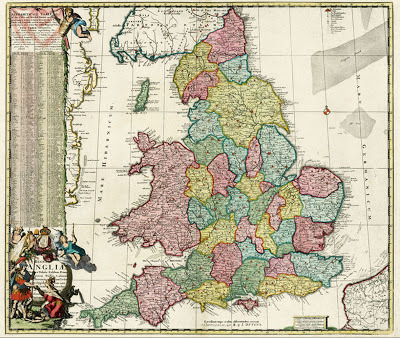 Third state of De Ram’s rare map of England, updated and corrected by Reiner & Josua Ottens. Includes a massive Alphabetical Table of the Cities and Market-Townes on the great roads in England Y Wales, Their Latitude and Longitude and in what County they are Lying . . . Ornate cartouche and rich full color. 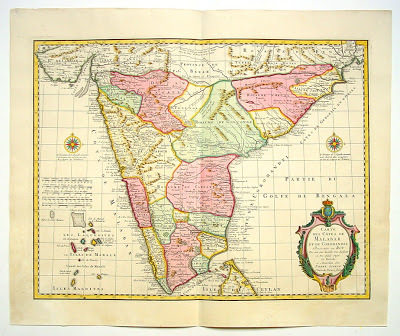 DESCRIPTION Reiner and Joshua Ottens’ re-issue of Schenk’s large map of India. Magnificent original colour. 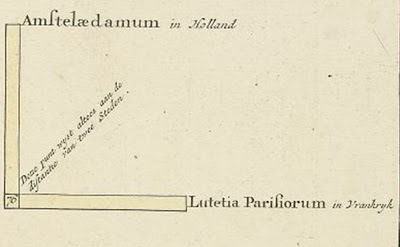 Joachim Ottens and his sons Renier (d.1750) and Joshua (d.1765), were prominent Dutch booksellers and map publishers from about 1680 to 1790. Joachim was initially employed as a copperplate engraver by Frederick de Wit (1630-1706), but founded his own business in 1711. Although he died only a few years later, his sons Renier and Joshua took over the firm and presided over its most prolific period. 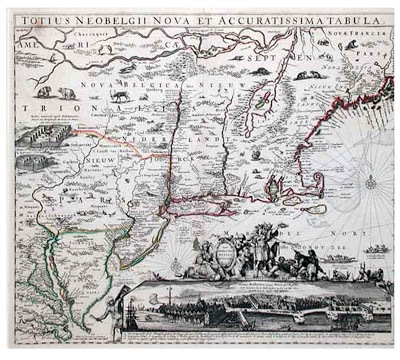 The Ottens family’s most notable contribution to cartography was its enormous made-to-order multi-volume atlases such as the Atlas Major. 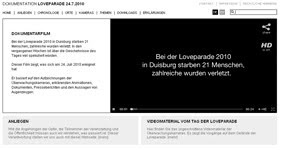 Aktion 1005: la campaña nazi para destruir las evidencias y cerrar el campo (desde marzo hasta julio de 1943. Destrucción total y se reconvirtió en una granja. Comandantes Franz Stangl y Kurt Franz, sentenciados de por vida. 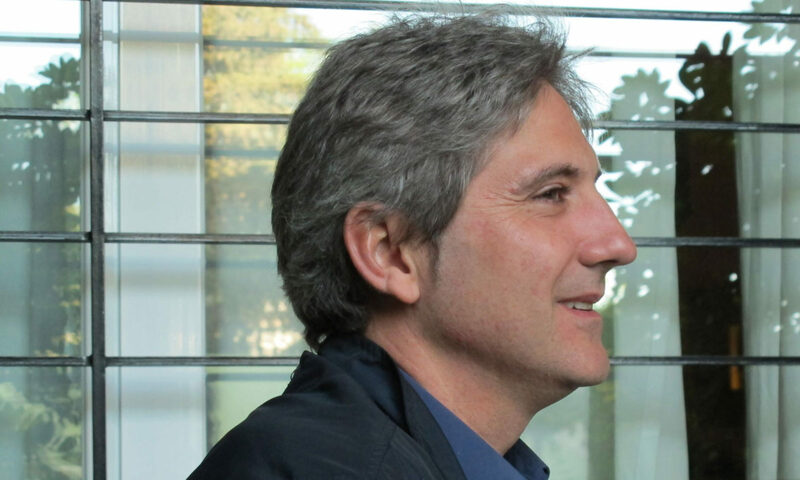 Samuel Willenber fue un superviviente del campo. 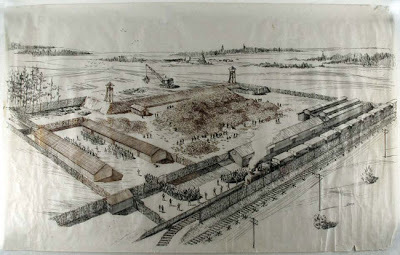 Ilustración del campo de concentración. Samuel Willenberg was born in Czestochowa in 1923. His father was a painter and teacher in the local Jewish middle school and his mother was Russian. The family moved to Warsaw shortly before the outbreak of World War II. In 1939 Willenberg volunteered for the Polish army and was wounded in fighting against the Soviets in the east of the country. In 1940 he moved to Opatow where he continued to teach privately. In 1942, in spite of possessing false documents identifying him as an Aryan, he was arrested and sent to the concentration camp at Treblinka along with the entire Jewish population of Opatow. 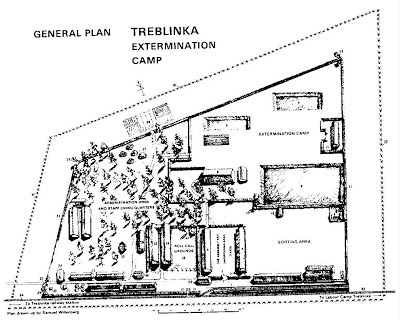 Upon arriving at the camp, he claimed to be a brick mason and thus succeeded in avoiding death in a gas chamber. He participated in a prisoners’ revolt in August of 1943, during which he was able to escape and get back to Warsaw. With the outbreak of the Warsaw Uprising, he joined up with a unit of the Home Army (AK), and in September transferred to the PAL fighting organization. Following the fall of the uprising he received a series of medals: the Virtuti Militari 5th class, two Hearts of Valor, the Silver Cross of Merit and the PAL golden fighting badge. In 1950 he left Poland for Israel with his entire family. There, he worked for many years as the Chief Inspector of Measurements in the Ministry of Land Development. Upon retiring, he enrolled in the People’s University, where he studied painting, sculpture and art history. In 1994 he was once again granted Polish citizenship. 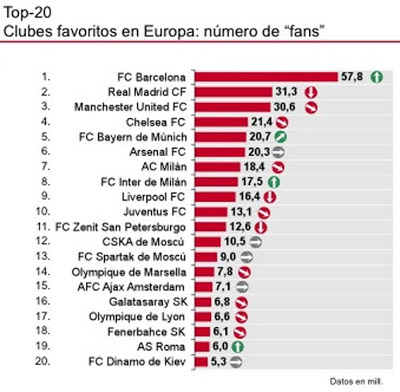 “Hacer posible el éxito de nuestros clientes en el negocio del deporte y del patrocinio internacional es nuestra misión desde hace más de 20 años y es, al mimo tiempo, el estímulo diario para que los que conformamos el equipo de SPORT+MARKT demos lo mejor de nosotros”. 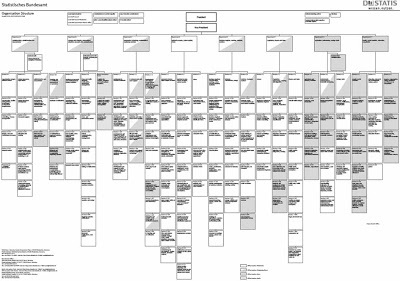 La división de gráficos y diseño depende de ‘Estrategia, planificación, relaciones internacionales, documentación y comunicación’. 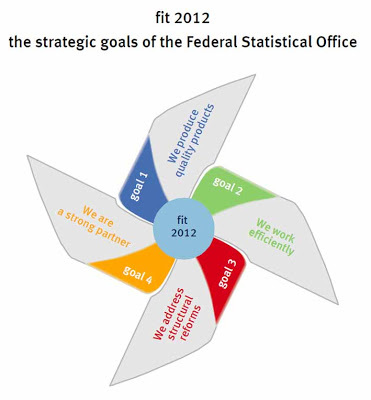 www.destatis.de of the Federal Statistical Office has become the main source of statistical information. 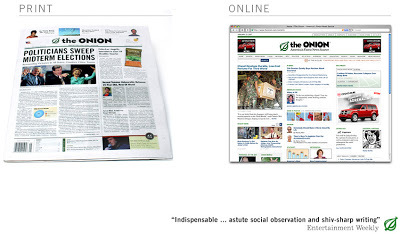 By extending the range of online publications and interactive applications in 2009, user access was improved. As more and more theme pages and press releases are linked with the database GENESIS-Online and with the range of international data, users find more quickly what they are looking for. 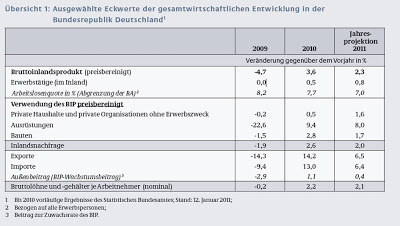 The number of accesses to GENESISOnline in 2009 (about one million) was twice that of 2008: Free tables, a new navigation and a WebService for registered customers had a positive impact on demand. 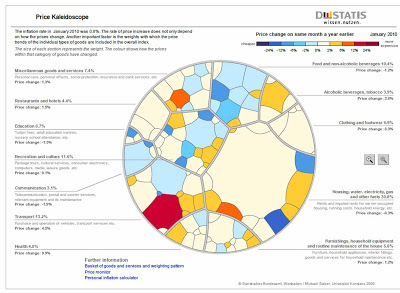 A new and innovative feature within the prices area is the price kaleidoscope, which is an interactive graphical application. The price development and the weighting of product groups in the consumer price index are visualised, so that the main origins of price increases or decreases are illustrated. 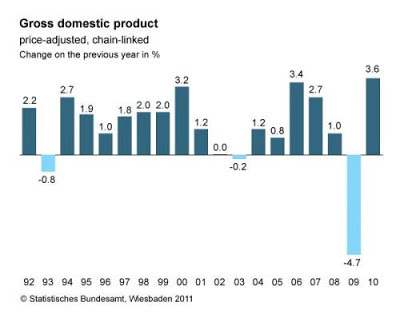 The inflation rate in January 2010 was 0.8%. 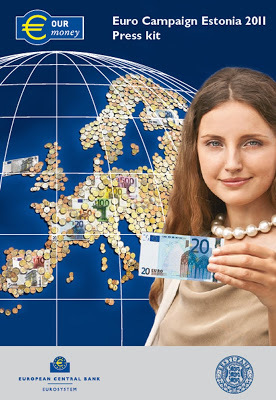 The rate of price increase does not only depend on how the prices change. Another important factor is the weights with which the price trends of the individual types of goods are included in the overall index. within that category of goods have changed. 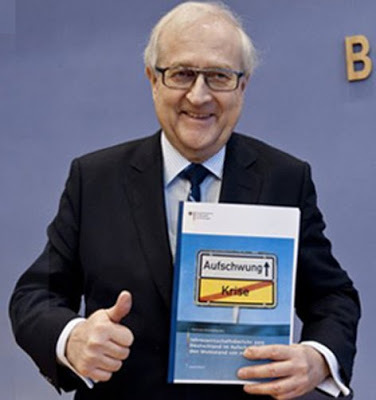 are easy to understand, it provides information that is well-based in terms of statistics and deals with issues which are in the focus of public discussion. The trend in the number of free downloads from the publication service is positive: More than 100,000 free publications were downloaded every month in 2009 – with topics focusing most frequently on demographic change as well as producer and consumer prices. 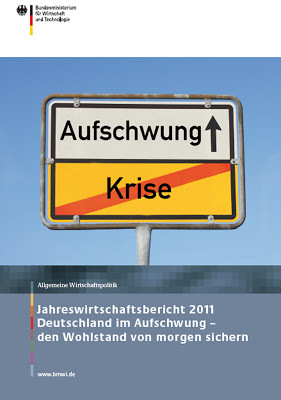 Since May 2009, the Federal Statistical Office, together with the statistical offices of the Länder, has offered a new interactive regional atlas with over 80 indicators at www.destatis.de/onlineatlas. 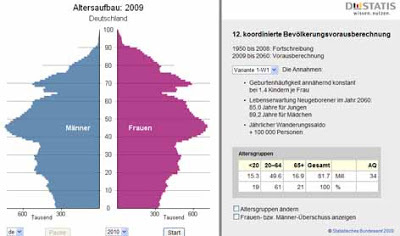 The visualisation of the statistics is based on data of all rural districts and towns not attached to an administrative district in Germany. Regional differences – for example with regard to economic power, internal migration or employment – can be seen at a glance. Jan Schwochow envía este link para ponernos los dientes largos.